One day a few weeks ago, I had unfortunately run out of eggs. It was raining outside and my car was in for service so there was no option to run out and get some. I felt very jittery and uncomfortable for the whole day, wondering whether maybe I should call my mum to drop some off for me? “That’s such a silly idea” I thought to myself, “she would think I was crazy!” But in actual fact, I really couldn’t live without eggs in my life. 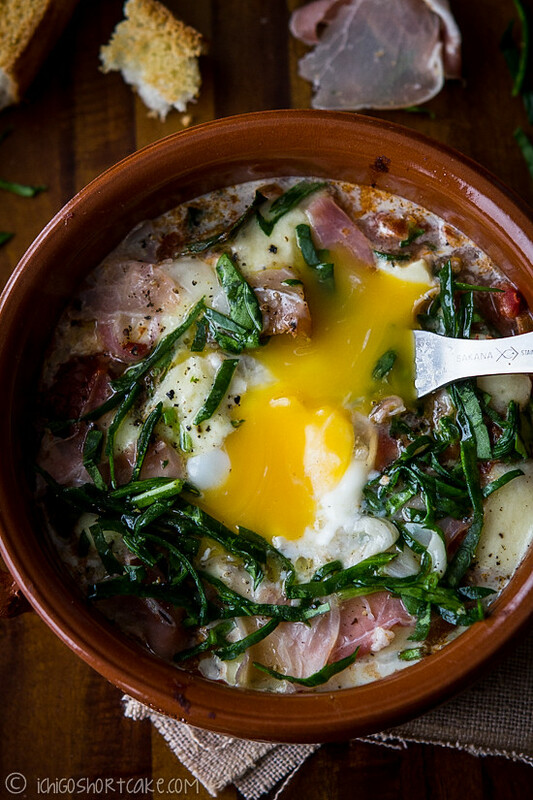 After I made my baked eggs recipe a couple of weeks ago, I realised there were actually many similar baked eggs recipes on fellow bloggers’ sites popping up everywhere! It’s sort of becoming a delicious fad. I actually made another version of this yummy recipe using quite different ingredients. I think this one tasted better, although not as substantial (just soak it up with toasted bread and that’s all taken care of). If you feel it’s not substantial enough, add in roughly 4 large potatoes (peeled and cut into chunks) like the other baked eggs recipe and follow the cooking instructions there. Also I’ve used pancetta here as it was readily available but you can use any type of cured meat such as Spanish serrano or prosciutto, or you can use a thickly sliced chorizo instead. 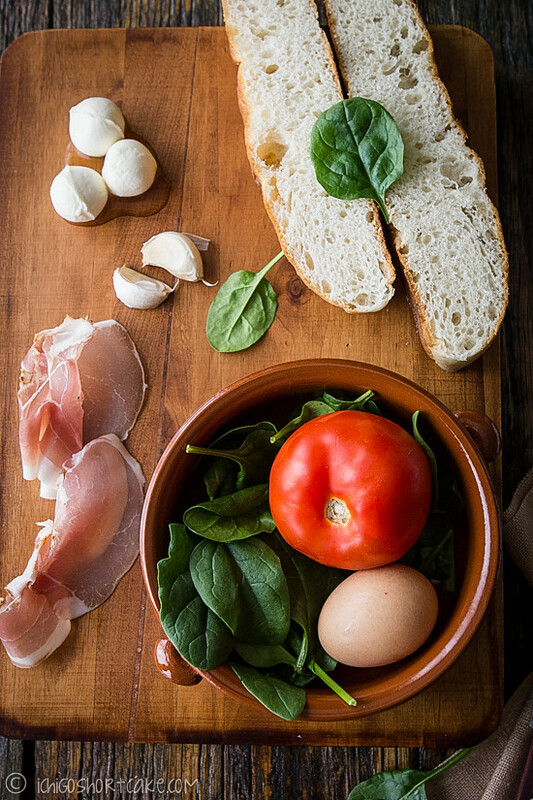 The bocconcini can be exchanged for cheddar or other grated cheese or can be omitted altogether (but believe me, it tastes better with cheese…). 2. In the mean time, heat a flat pan to medium high with olive oil, lightly fry onion and garlic until transparent. 3. Add in tomatoes, canned tomatoes and tomato paste and stir. 4. Add in smoked paprika, oregano and vegetable stock, make sure you don’t over salt your dish as the pancetta can be quite salty. This is when you add in your potatoes if you wish to have them in the recipe. 5. Add in washed and torn spinach, give it a quick stir through (no need to really cook it here) and take fry pan off the heat. 6. Transfer contents into 2 oven safe pots. Create a small well in the centre of the contents and crack 1 egg into each pot. 7. Bake in the oven for roughly 10 minutes or until the egg white is solid white. 8. Take the pots out and put bocconcini on top, put back in the oven and bake for a further 5 minutes or until the bocconcini has melted. 9. Remove from the oven. Add roughly torn sliced pancetta on top, season with salt and pepper to taste, a drizzle of olive oil and a small handful of roughly chopped fresh spinach as garnish. Serve while hot with toasted Turkish bread. I think I liked this version more than the potato version, although it’s just my personal preference. This recipe tasted lighter and fresher but of course less substantial without the potatoes. Question time: What’s one most important thing in your pantry that you can’t live without? Thanks for the recipe, it looks delish!! 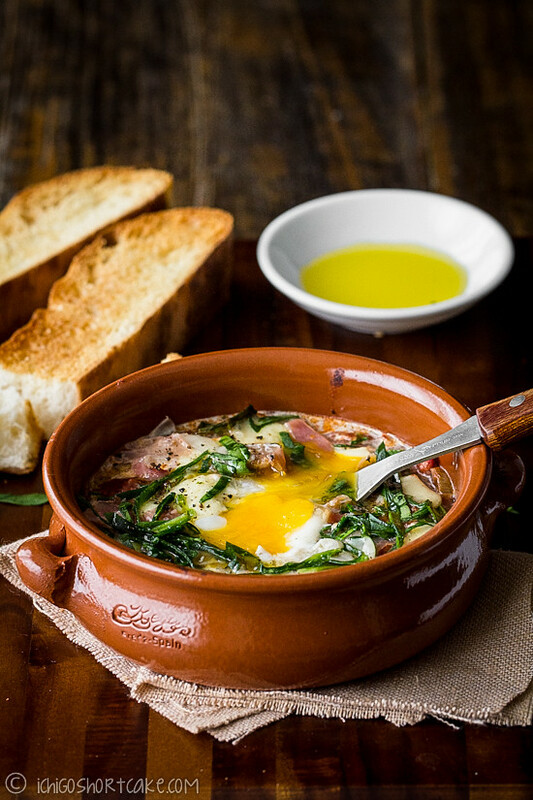 The baked eggs look divine. And your pictures are just gorgeous! isn’t bake egg the best thing? I will make this for dinner too! What a gorgeous breakfast… love it. I ran out of eggs last week also and it felt disastrous! Then I bought one of those HUGE packages of like, 18 eggs and all felt much more right in the world. Plus now I can make this! Mmmm. As we don’t go out anymore for brunch, this kind of “fancy” breakfast do the similar job at home on weekends. I just need my husband to wake up a little earlier for this dish… eh? Yes, he makes weekends breakfast. 😀 Tee hee. Totally agree about eggs… can never get enough of them… love the creamy, liquid yolks so much. Pleasure is dipping toasted bread into a soft-boiled egg, so I can totally see this being something I’d love! That is a tasty and rustic looking meal. Yum! We eat tons of eggs too. I love a runny yolk, although I’m also a big fan of hard-boiled eggs. Nice to have choices! Really nice recipe – I think it’s more than substantial enough with some bread or toast for dipping. we go through tons of eggs in our family, they are just sooooo versatile! this is a gorgeous breakfast! i’d love to be eating this! Yes they really are versatile…goes so well in both savoury and sweet dishes…or on their own! This recipe looks fantastic – I have noticed the amount of baked egg recipes popping up lately as well. Will have to try this one. Just found your blog after reading fruitsaladmixedveg – lovely site! dipping the bread in the oozey egg.. mmmm! This looks incredible.. . & you are right, definitely worth of any time of the day. Same here…we use lots of eggs. I often will poach an egg for lunch just to go on top of my salad. There isn’t a way that I don’t like them cooked. 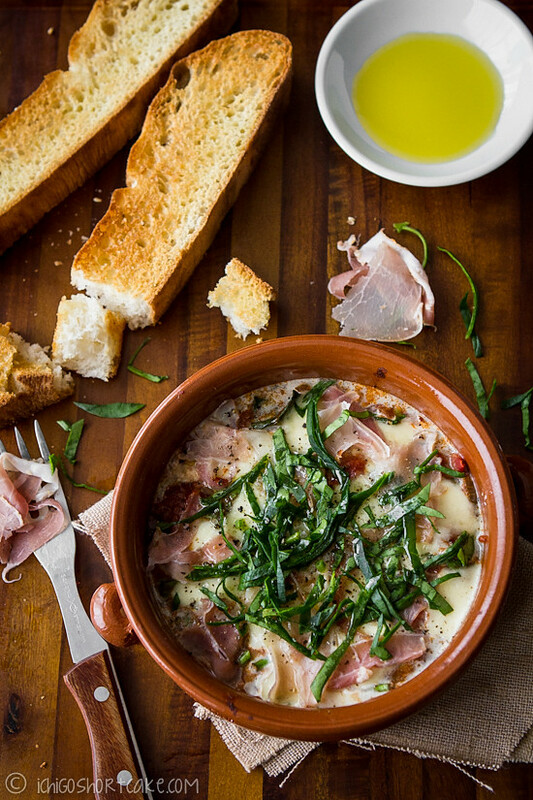 Your baked eggs dish looks fantastic. Yes same with me! I love poached eggs, or fried…or boiled even, as long as it has runny yolk. 🙂 I’d put poached eggs on everything now as well…sooo good. when i convert Celsius to Fahrenheit it turns into 393* is that correct? Yes it does seem correct, although the temperature really doesn’t matter much I think. If you have it at a lower temperature, just leave it in the oven for slightly longer until the egg is at the right state that you like. I liked mine a little more runny so didn’t leave it in for as long.